In the event of a terrorist attack or natural disaster, crisis management is nearly impossible without an effective, reliable means of communication. Such disastrous events place increased demand on existing communication networks and in some cases destroy the infrastructure supporting their function. 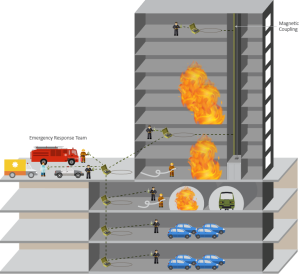 Vital Alert can provide redundant, independent, emergency communications that integrate with existing radio systems and provide first responders with the ability to communicate throughout a building both above and below ground, wherever traditional radios have failed or are ineffective. With the additional use of magnetic coupling, communication can reach high into the upper stories of a skyscraper and along subway tracks below ground.